Dr. Alan Patterson is the Founder of Mentoré, a consulting practice specializing in leadership and organizational development, and a thought leader at the Business Learning Institute. Dr. Patterson also wrote Leader Evolution: From Technical Expertise to Strategic Leadership, which defines the four critical stages needed by individuals with technical or specialist backgrounds to move into leadership positions. Although a lot of things have changed in the business world over the past few decades, one thing has stayed the same: we acknowledge that communication skills are important, but we don’t necessarily act like it. Dr. Patterson will tell his clients, “I can’t believe I’m making money going to organizations telling them that they have… to be better at listening,” but it turns out no one is immune from underdeveloped communication skills – being in a senior position doesn’t guarantee that you’re a better listener (and sometimes it’s just the opposite). Dr. Patterson has a personal challenge for you: Think of one person you know that’s a good listener, then talk about that person and what they’re like and what they mean to you. The results will likely be pretty dynamic. Dr. Patterson believes that people who don’t develop emotional intelligence, empathy, moral character, courage, relationship management, influence, and persuasion skills will, guaranteed, top out in their career; they will be frustrated because they will be passed over or put in a box. So what do people need to start working on today if they want to go from technical expert to strategic leader? Broader visibility, broader understanding of the business, providing guidance, and selling those ideas to others – And you won’t get seen, learn about the business, or have credibility if you don’t first learn to listen with empathy. Peter: [00:00:00] Welcome to episode 73. Today my guest is Dr. Alan Patterson, who has more than three decades of international business experience. In 2006, he formed Mentore, a consulting practice specializing in leadership and organizational development. His expertise has been tapped by many global and national businesses and organizations including Anheuser-Busch, Biogen, the Federal Reserve Bank, Johnson & Johnson, Hewlett Packard, Major League Baseball, and the United States Navy. He is the author of Leader Evolution: From Technical Expertise to Strategic Leadership. Dr. Patterson has been a college lecturer and He’s a frequent presenter at several state and national conferences. He’s the past board chair of Fond du Lac, a Boys and Girls Club, and is a member of the Fond du Lac woman’s Fund board. I’ve known Alan for a number of years because he’s in one of the thought leaders at the business learning institute. Alan thank you so very much for taking time out of your hectic and busy schedule to be a guest on my podcast. Alan: [00:01:01] Peter this is this is a privilege more than it is anything else. I’m privileged to be with you and your audience. Peter: [00:01:08] Oh thank you so very much. I know my audience is going to enjoy this conversation today. So I’ve given the audience a little bit about your background. What else can you tell us about the Dr. Alan PATTERSON? Alan: [00:01:22] Well the Dr. Alan Patterson… I can tell you that I started my career in education. I got a doctorate in education way back when they still weren’t writing on tablets but they weren’t at computers. Alan: [00:01:40] And I always had an interest in the consulting training and development field. So I made that switch back in the 80s and worked for a couple of consulting groups then joined two of my partners for almost 20 years in Providence, Rhode Island, doing similar kind of consulting I’ve done before in the past. And it was all about that competency development range finding out those additional factors that make somebody successful in that job well beyond technical expertise. And 2006 was a momentous year because we we split up – it was all amicable. I decided to continue on my own and had been doing that. While my background is not the same as yours Peter and I’m sure many of your guests – I’m more out of the social science psychology side of life than I am a CPA. I don’t have that designation or background, yet I’ve been fortunate and doing some work over the years starting with AICPA. And then when I met through the business learning institute and I you know I was trying to think today I think it’s it’s I think it’s 10 years. It may even be a little bit longer. 2005 for some reason pops up my mind definitely 2007 before 2008. So I have some familiarity of working with folks in your field in the field of finance and accounting, both public accounting and business and industry. So what can I say? I’m a lone ranger. Hired gun. You need help? The doctor is in. Somebody wanted one of my marketing guys years ago wanted to call me that the doctor of business – organizational development something like that and I thought well that’s a pretty good title. Peter: [00:03:36] Yeah that is. Alan: [00:03:37] Organizational coach, not an individual coach. Peter: [00:03:40] So you say you were I mean you’ve worked with CPAs for a while. And what are some of the courses that you’ve been that you have worked with them through the business lending institute? Alan: [00:03:49] Well even before then one of the first courses I did with AICPA I call From a Controller to CFO. And what the differences were in those jobs as I understood them and that that theme really is the basis for the book that I wrote, which happy to chat about briefly and in a few minutes. So that course from technical or financial expert to strategic business leader is one of the more popular courses that I do with a business learning institute. How to operate as a partner and strategist to the business. High performance teams. I’m rerecording some webcasts right now to include what I’m going to title what it takes to be a successful first time manager. Then other courses along the way of building trust and credibility. So it’s all on the the side of building relationships getting more savvy about the business. Less on the wall not even less. Nothing on the technical side. I’m not the I’m not the guy you hired to do a tax update, if I would we’d probably all end up in jail. But if you need you need a kick in the pants about a delegation I probably your guy. Peter: [00:05:13] Yeah you’re much. We use the term soft skills and I’m not a fan of the term but I found a way that kind of connects with people. So we may call them soft but actually pretty hard to master. Alan: [00:05:28] Yeah that’s a good way to. Peter: [00:05:30] And I get the light bulb body and then and then I think Tom Hood has just gotten rid of and just call them hard skills. Alan: [00:05:37] Yeah I’ve had clients correct me and say they’re not soft at all. Peter: [00:05:41] They’re not. And so when that first course that you did with the CPA back in the day and to what you’re doing today. Have you seen any change in that AUDIENCE MEMBER? Are they coming maybe a little bit more prepared. They have a little bit more these interpersonal skills than they did back in the day? Or are you not seeing very much of a change? 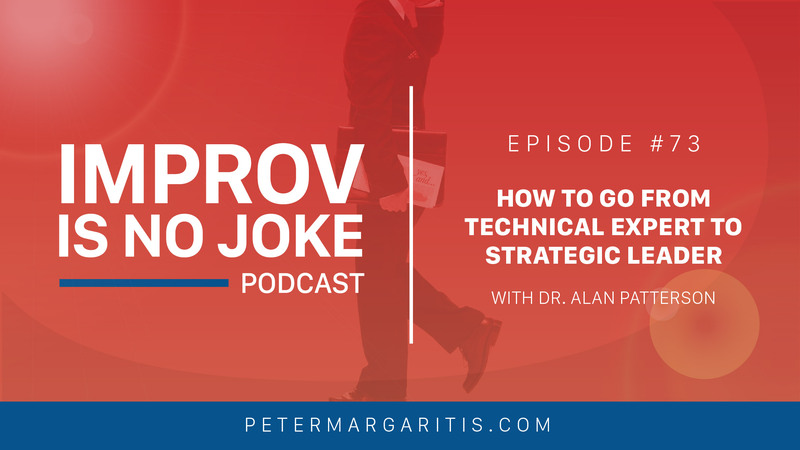 Alan: [00:06:05] Well I think you know it’s funny you say that because that first course I did for AICPA I recall was 1997 and Goldman’s book came out 95 – Emotional Intelligence – but it wasn’t it wasn’t described that way. I think I found more people aware of the emotional intelligence side of life and its place than Job Success and business success. Having said that there is still a group of people that will will articulate that the interpersonal skills is not their strength and I don’t think… so from that vantage point I don’t think it’s changed at all. Maybe this is just gut. I think there’s more recognition that there’s another set of success factors. Yet I think the profession, much like… I work with a lot of scientists engineers I.T. people. It’s a very very similar pattern that what drew them into the profession was not the selling your ideas. It was it was doing the work. It’s doing the work. Peter: [00:07:23] There’s a book you should read it’s called if you are If I understood you, would I have this look on my face? and it’s by Alan Alda and it’s along the same lines of you know in the scientific community on how he’s found a way to you know get his audience to understand him by putting things in not in scientific terms but in plain English. Peter: [00:08:47] I would agree with that. 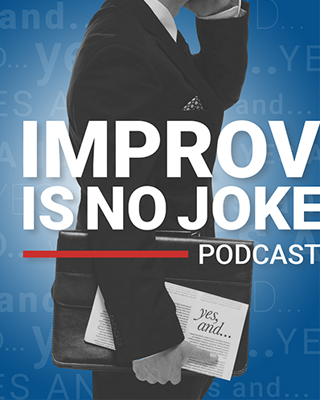 It’s when I’ve worked with audiences you know that active listening – that listening to understand is a component in improv, and whether it’s 20 people in the room or 100 people room I’ll Ask the question how many of you feel like you’re good listeners? and I may get less than 1 percent of the hands going up. And then I’ll ask how many of you are interruptors and I’ll get about 75 percent of the hands up. Alan: [00:09:14] Yeah. Well I I say — and this is this is I take this on as a personal challenge to your audience here. Think of somebody you know that’s a good listener. Think of one person you know that’s a good listener. And talk about that person and what they’re like and what that person means to you. And it’s it’s pretty… it’s pretty dynamic. So I think that’s one of the biggest compliments somebody can give another person – because good listener doesn’t mean you’re a pushover. But it’s at the root of so many of the issues that you know… what what was what’s the latest issue. I think the latest issue the 2010 decade issue is pivot, but before that it was Team work. No before that was empowerment before that was team and before that was communication. I mean what are we talking about? You know it’s still there. Peter: [00:10:12] Yeah it hasn’t changed. And I think to some degree I think the larger your organization gets larger and larger and larger, the listening goes down considerably because decisions have already been made. They’re not really looking for input. And thatt thing about listening is you know to be in to be an active listener or someone who listens to understand – you got to park your agenda. You got to park what you’re coming to the table with and be focused and give that undivided attention to the individual, even while they’re talking you can still process information and when they’re done ask a question. Make a comment. Add to the conversation. Alan: [00:10:52] Putting aside the fact that that dialogue and civil discourse are in the crapper. Just the listening part of this to me is pretty intriguing cause, Again, Daniel Goleman… you see where he’s headed now. You know he’s written a book on a couple of years ago on focus. So this has come out of emotional intelligence interest and now he’s into mindfulness. And so it’s it’s a low level of distraction that people are dealing with… It’s not just distraction. First of all it’s it’s just that day to day morass of incoming God knows what, and heaped upon that is how do you know where the priorities are if you don’t have your head screwed on straight? It’s put the need to to listen at a premium. And a lot of people are talking. That doesn’t help. It’s not that you have to listen to all the talking. It’s just that you know when you need to focus, and you do and it’s more meaningful productive conversation. And how many of those conversations are tied to decisions? So it’s a business issue. It’s not just a social interaction issue. Peter: [00:12:09] And it’s funny it’s funny you should say that. So last week I was in Omaha. Nebraska. driving to Lincoln, Nebraska, and there was a billboard sign that really caught my eye. It was a mutual of Omaha billboard and I think if my memory serves me correct it said we start by listening first, or something along those lines. And that’s that’s one of the few billboards I’ve ever seen where they’re addressing come and talk to us. We’re not going to talk to you – we’ll get to listen to you first to understand what your needs or wants are before we make any type of response. Alan: [00:12:47] I mean you think about it and even just take this conversation we’re having as an example. This is fundamental. I mean this is what you want people to master. Soft skill, hard skill, what kind of skill you want to talk? Communication skills. OK well Isn’t this fundamental? And it is because there’s so much that has to happen that’s based on doing this successfully. We’re not even talking about the business per se. We’re not talking about professional development per se. I would say this: I think the people that don’t have those skills – the emotional intelligence, the empathy, the character, moral, courage, relationship management, influence, persuasion – all those things that I talk about and you do as well. They will, guaranteed, top out in their career, and they will be frustrated in their career because they will be passed over or put in a box or put in the corner or put in the time out place. You know that’s what it boils down to. It’s not that it’s not the knowledge side. It’s not the technical, the financial side. And so I would I’ve even said Peter… I think the characterization of a subject matter expert is not just that they know a lot and have a lot of experience. They know a lot, have a lot of experience, they’re approachable, available, and visible to other people to help them solve their problem. There you go. Peter: [00:14:18] Perfect. So this this this active listening this empathy this this what what seems to be lacking. How do you how did you tackle this? Because as you were describing all of that I I I have one small rebuttal to that comment, especially as it relates to public accounting because I’ve I’ve talked to firms and they recognize that some of the staff who have made it up maybe to a senior manager level… that they provide something to the firm from a strictly technical perspective. They’re not going to drive any business. So instead of making them an equity partner, they give them a directorship level. Not an equity partner. They’re not expected to go up and bring in business, but they’re expected to be the subject matter expert, technically, inside of that organization. And I’ve I’ve only seen that in a few firms in public accounting. But you don’t see that business and industry .I have no run and that acceptance. Alan: [00:15:18] Let’s just look at it this way. I’m not saying those positions don’t exist. I’m not saying that people are not valuable to an organization for anything other than their subject matter expertise. I would say there is a baseline, a threshold, that has to exist, if nothing more on the approachability side, and the understanding and willingness to be clear and… would have a way to engage people. They don’t have to be an extrovert. 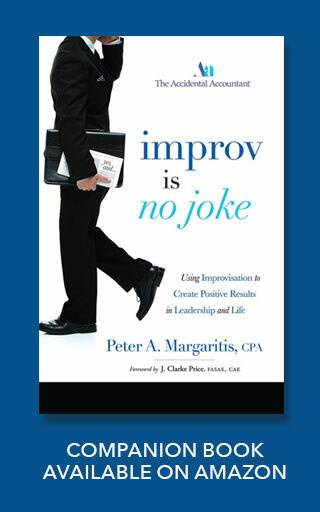 They don’t have to be Dr. Margaritis getting up on the stage doing improv. You know I often find people saying well you know I’m an introvert. Like I don’t care. That’s not the point. The point is that you still have to have a baseline of understanding beyond just the technical or financial knowledge. Yeah I remember a guy I used to work with years ago and I love this guy. He was a he was one of the founders of this process that created this very generic now highly successful software and something or other. And he’s the only guy in the world now that said I don’t want any distractions. Give me an interior office with no windows. And it’s like just to let me do my thing. I don’t want to manage other people. And yet he was one of the most approachable people I ever met because he he loved what he did and he was just so good at it. He was he was great. Peter: [00:17:02] And I think about a lot of people who may get into the accounting profession because maybe they they want to do that kind of the exact same thing, and maybe they’re introverted and maybe they “don’t like people.” But I think in today’s world, if you’re coming into the profession like that, then in order to excel, in order to grow your career, in order to move up the ladder, you’re going to have to find a way to make those connections and start liking people, and if you’re a public accountant driving business, networking, business development, or you will be moved to the side. Alan: [00:17:36] Yeah I mean you said this you may see those people who are subject matter experts. They’re put in some type of directorship and not an equity partner. Listen I don’t think… I found out in that course good going from controller to CFO… I had several people over the course of the three or four years I was doing this that would come up to me at the end of the day. These were long ago in the days of 8 hour oh my god can I hang on to it at myself eight hour workshop. People come off at the end of the day… some people will come up and say you know what I don’t want to be a CFO. That’s not what I want to do. I don’t want to deal with that maybe the business and accounting side. It is just on the political side. It’s like nobody says you have to. So nobody says you have to be an equity partner. Nobody says you have to be head of the lab. Nobody says you have to be an engineering director. You want to be an engineer? Fine. I’m just saying. And it’s a point you made. What’s your personal goal in all of that? And if it’s to have a broader impact, which most people want, or feel that you’ve been more successful, than what I would say is… Well there’s a little more than what you what you signed up for. Actually there is a lot more, but I’m not telling you don’t do that. I’m not telling you to not be the tax guru or the audit guru. I said go for it. I’m just saying that real success, and especially from a business perspective, that the success there lies with not just understanding, but really a solid use to mastery of different skill sets. It’s different. Peter: [00:19:21] Solid use to mastery. So I can come and take one of your eight hour, four hour, two hour. Peter: [00:19:30] 20 minute whatever it is and then I’m going to have that mastery after that. Alan: [00:19:36] Yeah. No. I don’t. I. I make no claims. I mean about that. I don’t think that’s– you know people want the easy answer. I’ll say OK here I’m going to give you the easy answer. You have to learn how to influence other people, and influence is based on credibility. I don’t have– there’s no shortcut. There’s being smarter about it, but there’s no there’s no shortcut. Peter: [00:19:58] There’s no shortcut. But I think people go… I think it was actually what Simon Sinek, I was watching one of his videos, and he made a comment that I can’t teach you leadership. I can give you some tools, if you come to one of my sessions or watch a TED talk. I can present you with the tools. However you have to practice it every single day to get the master level but what happens with that AUDIENCE MEMBER? They go right back to work the next day or the following Monday. And they get stuck back into that rut. Alan: [00:20:27] Well you know mastery.. who do you want to read about talking about mastery? I mean there are several gurus out there, Sinik being one of them. And it’s — all of them that I’ve read say the same thing is that it’s drudgery. There’s nothing there’s nothing about mastery that will be exciting. It’s the day to day overreaching. You know how many thousands of free throw shots did Michael Jordan do? How many hours of practice does a classical violinist do? How much time does the Olympic swimmer spend in the water at all hours of the day and night? And I mean this is I don’t… you and I are a little bit different age but probably in the same broad category of our career. You know how much of what you know now is based on 20, 30 years of experience? That you wouldn’t have had earlier. And that that to me is now is– the legacy I want to have is I don’t think there are shortcuts. I do think that there are ways to get people focused early on in their career to be very clear and understanding what are the skills, what are the practices, what are the techniques that you can use to be successful, and head this off in the past when you’re going to hit a point in your career when you when you are thinking OK what does it mean and how do how do I get to the next level. Well it’s going to be a different skill set. That’s what I’m going to tell you. It’s not going to be knowing more. At least know more about accounting or finance. It is going to be learning how to be to be successful in working through other people and selling your ideas. And it’s going to be a ton about learning the business, not finance and accounting. You want a seat at the table? That’s how you get it. You get to seat at the table cause you understand the business, not because you’re good looking like you or me. Peter: [00:22:37] Haha. So two things here. We’ll come back to that last piece that you said, but as you were you were talking about that drudgery. Maybe it’s made me think of a quote. I love this quote quote as by Robert Schuller: Spectacular achievement is always preceded by unspectacular preparation. Alan: [00:22:56] That’s what it is. Yeah I had a doctor when I was like 13 years old I broke my arm. Yet again. He had already put me to sleep. But he knocked me out for a lot of reasons. But I remember he told my mother and she told me he said what I’m going to do in the next five minutes took me eight years of medical school and beyond to learn. Alan: [00:23:23] It’s like oh OK. Sure go ahead and snap it back into place. I’m all for it. Peter: [00:23:32] Make sure that I’m knocked out please. So going back to the other thing you said: getting to know the business. We have to understand the business, and the business is more than just the finance side of the business – it is operational, and we in the profession have been talking for a long time. We want to be our client, and I use that term in a broad base. Whether it’s public accounting or whether it’s a B&I, I want to be my clients trusted business advisor, and there’s a difference between the trusted business advisor versus a trusted financial advisor. Peter: [00:24:01] And I did– I wrote about two years ago basically it said it’s time it’s time for us to get up from behind our desk. And the premise of it was if you want to be the trusted business advisor, you need to explore the business – not just the financials. The whole business in totality. Alan: [00:24:17] Peter, I would say it’s more. It’s not that you have to explore the business. It’s you have to know the business. You start off with the exploration. So let’s imagine people had you or me as their coach. You and I together. What would you be telling somebody that’s 10 12 — maybe not 10, but 12, 15 years in their career? You start off with OK. Well you know what you know on the finance insight, on the accounting side. What do you need to do to build that out? How do you stay on top of it? OK here’s the deal. From this point forward that’s a given you don’t get extra credit. Let’s talk about the people you need to be in front of and how you do that, and how you have your visible and available to people– that you are more visible to people that you haven’t seen or that have seen you or know you. And then at that same mark you’re going to say OK let’s talk about how you learn about the business. You know what you know… where’s the business headed? what are the trends? I mean this is where all this strategic stuff kicks in. But for somebody that’s in there I don’t know what would 15 years of experience be in this day and age… mid 30s or so? It’s like OK you want to depending on where you’re going and where you’re headed. Even as a high level individual contributor I would say that differentiator there in terms of successful performance are still on the business side. There’s there’s an understanding and knowledge of the business and how the business makes money, and the fact that you know finance and accounting is– you’re in a position that most people are in the business. They don’t get to see what you see. They don’t know what you know. So you can wow them with your knowledge of I don’t know what what what do you need knowledge of these days? International tax codes or or which country we need to do our assembly and where do we manufacture. You can know all those things and that’s valuable. But it’s that you understand what that business is doing. Where you can say you want to save money? We need to go here not there. Or let’s talk about the risk. I mean this is not my specialty. This is your audience’s specialty. It’s like you want to you want to talk about this now – not about taking risk, but how you understand what risk looks like, and the risk that you’re about to take out. So that’s that’s the business advisor part. It’s like yeah it’s it’s a crapshoot. Just as long as you understand what’s there and how we stay legal and you know maintain our reputation and do what we can do. It’s like let’s just know it. Ready set let’s go. Peter: [00:27:09] And I take it there’s probably a lot of the content in your book. What do you tell that AUDIENCE MEMBER… How do how– what’s the one key thing that they need to start working on today to take them from technical expertise to that strategic leader? Alan: [00:27:25] Well it depends on where you are. Alan: [00:27:27] Because the one thing is going to look different. Peter: [00:27:29] I’m controler going to be a CFO. I’m a CFO that wants to maybe move to the C-suite. Alan: [00:27:36] Broader visibility, broader understanding of the business, and providing that guidance and opinion – and selling those ideas to others. You got to be– I had a colleague a number years ago. This was on the H.R. side, not the finance side, and she was the number two H.R. person in a Defense Department contractor of over hundred thousand employees. And I said Well so what’s your day look like? And she said I’m in meetings all day. I said Oh you must hate that. She said Are you kidding? I love it. Most of the time I’m with the people I need to be influencing. So you want to take that next step? That’s what you’ve got to do. And it’s not going to happen from controller to CFO. It’s you you started that– you have to have that credibility, that expertise not just on the finance and accounting side, but on this broader application side sooner, and the CFO part comes because… I mean how do you get those jobs? Because you go into a smaller company or you’re CFOs moved over to a different company or you CROs moved on and you’re in there on the bench for that ready to come up. Hopefully you’ve gotten those additional experiences. And it’s really you know it’s that that understanding — it’s not you understanding, it’s being a part of those decisions. Peter: [00:29:09] When you were describing your H.R. person at the defense contracts it reminded me of a story of a good friend of of my wife and I. When she started a career in retail, and she started in H.R., she didn’t have a college degree when she started. And she says to this day I could never have… today she probably wouldn’t have gotten hired. So but she went from no degree as a H.R. specialist, and over her career, when she retired, she retired as the executive vice president of Human Resources for a Fortune 500 company. And I asked her how did she do that. And she said I had to get my technical side of the business down, but once I got to become manager I had to understand how the business worked – and this is what gave me the idea for the article. I had to understand how our business works, so I went to sales and asked how do how do we support you? What do you need? She went to customer service, she went to distribution. Then she said I had to come to finance and talk to the CFO, and he was talking chinese to me. So I had to get him to put accounting into a language where I understood, and how we supported the business. And she was one of the trusted business advisors of a Fortune 500 company. And I just loved that story. But to the same to the same discussion. Alan: [00:30:31] And distill that down for me, Peter, as the master improv entrepreneur consultant educator entertainer that that you are – distill that skillset down of this colleague of yours and friend of you and your wife. What is it that she did? What’s the skills that she use that made her successful? Peter: [00:30:53] Oh she is. She is the master communicator for one. She connects well with everybody. She’s she’s very she’s very firm and she holds her ground. But great on managing relationships, great on building relationships, and and having empathy. I think those are her big skill sets reflecting back, as well as she’s a very very driven individual. Alan: [00:31:21] Which now that we’re not going to teach anybody. Peter: [00:31:24] No you can’t you can’t teach that. Alan: [00:31:26] We’ll take intrinsic motivation and put kind of put that one aside and say that you can’t develop that. I mean if you did it’d take you… you’d die before you could really help somebody so… But there you go. That’s what it is. Great communicator. Great understanding. Great listener. But look what she did. And this is the crux of what I say about how to be a partner and strategist in the business – what I’ve done, and I encourage anybody to do. You don’t have to read my book to do this: You need to go out and talk to people and listen, and you know what we call that? We’ve got a name for that. Alan: [00:32:07] That’s called a dialogue. Alan: [00:32:11] That’s not problem solving. Do you remember what a dialogue is? I said a dialogue is when people go for mutual understanding – understanding is not agreement. It’s talking without listening. Those are dueling monologues, and you can’t take dueling monologues and say because you’ve got two or more people going it’s a dialogue. No. She went out and said Tell me about how we support you. Tell me what your challenges are. If we were to do one thing better what would that look like? I’ve been thinking about this. What would that do to your group or How would that impact your group? Oh OK great idea. Hold that thought. I want to go talk to somebody else and see how they see it and bring that back to you. Is that something I can do? Well of course yeah. You’re talking about my business of course you can. You’re going to help me. So I just take… This is the competency approach. You just take your colleague, your friend, take what I mean take is you watch her, you observe her. You then start to say OK what are the skills the behaviors tools techniques that she uses. And then you go to people that may or may not have said OK here’s what you need to do. You want to be a partner and strategist? Here’s what you have to do. You have to pick those people that are that are are not just in the critical path, but there’s some priority around them, and then you go out and you talk to them. You need to ask open ended questions, you need to probe, you need to listen. You need to decide what else you need. You know what you can and can’t do. Don’t make these problem solving sessions initially because everybody wants to solve the problem. But I’m saying there is a problem solving aspect, but the basis of the relationship is the dialogue. Peter: [00:33:56] And sometimes we– I I spoke to a partner in a firm and she made a comment that she could speak to 4-500 people in a presentation and have no worries about it, but to get in a smaller conversation with maybe three or four people. That was a challenge for her. That was a struggle. Chris Jenkins, who is the CEO of the South Carolina Association of CPAs. He was sharing on the episode that we recorded something similar to that, and how he got past that to be able to engage in conversation. He said that when he was at the Ohio society they brought in a presentation specialist, and basically he told Chris next time you’re in the elevator, strike up a conversation with the person there. And then you know introduce yourself and say this is what you’re working on, this is the challenge I’ve been given. And he did it and he kept doing it and he kept doing it and he kept doing it, and despite all the restraining orders he’s had– I’m just kidding. But I mean he just he just kept doing it and put it in a play to the point that it’s now second nature. Being in a group of a smaller group and being part of that dialogue, or getting into that dialogue. Alan: [00:35:16] You know what’s ironic to me about it, Peter, is the questions are really simple. And the goal is to have people talk and for you to understand what they’re talking about. So you know why do we talk about the weather? Why do we talk about the Red Sox? Why do we talk about the hurricane? We’re talking– We’re trying to figure out a way to see what– Those are things we share in common, or at least we have an opinion on. Right. The weather is pretty obvious but that’s you know how was your weekend. All those things are intended to look, or should be intended to look for ways that we connect. I mean I don’t know about you. I have no problem. As a matter of fact, it’s just the opposite for me. I can talk to anybody in an elevator. It doesn’t take anything. You know I get in an elevator coming back from the airport. I mean I’m in you know going up to the car somebody is there with a suitcase. Well are they are they coming back home or are they going out? Well they’re not going out. They’re coming home. Where have you been? You know I bet you’re glad to get home. So yes I think the point I think people may miss it and that’s one thing I have done– I did a few months ago with a client in Florida through BLI and it was about how to be a partner and strategist. I said OK let’s make this a little scientific. Let’s create a protocol. That’s a fancy way of saying five open ended questions. I want you to think of a specific person you have in mind where you can go in and talk to them and listen to them. And guess what? You get to say in this too. Dialogue goes both ways. It’s just that you’re doing the initiation. You don’t go in and say OK I want to be your business partner, which everybody wants to be so big deal. But this is this is something that looks a lot different. And that’s what you know when you’re sitting down with three or four people that’s what makes it real. You know it’s not just anonymous. OK here’s one good idea. It’s like no I want to know how we– I need to understand manufacturing better if I’m an H.R. professional. How am I going to serve you? I’m a I’m a finance professional. I’m a business analyst. I’m good at what I do. I want to understand where this business is headed or this part that I support of the business. I want to understand where that said and what this is going to look like and what the implications are. I want to know that stuff. And most people will talk to you about that. Business people, if they’re good, because they need the help. Peter: [00:37:54] They do. And there also has to be a level of trust before before anything is exchanged really there has to be at least a baseline of trust and respect. Alan: [00:38:04] There’s no doubt that that’s just part of so. So this again to be a consultant here this is how do you break that down into its component parts? And it’s not saying I want to be your business partner. It’s taking those opportunities where you work together or finding or creating those, and then being successful. Commit and deliver. And the more you do that, the more you build on it, the more you trust it. And the more you trust it, the more you can find out about what their challenges are and what keeps them up at night. And now we’re talking for the long haul. I mean that’s that’s… But the success is built on actually accomplishing a project, a goal, an activity – not just one but many. That’s how you do it. I kind of back into it. I thought well let’s just do let’s play You know going into a group play we are the world, hold hands, and say Peter I want to be your business partners and we’re here to support you and all that other kind of B.S. that nobody buys. You go toe to toe and work on something now, Now you got it. Now you have a chance. Peter: [00:39:15] Exactly. I mean it’s you know it seems so simple as we talk about it but we know that it’s difficult in application. Peter: [00:39:25] And it just it just — persistence. It just takes that will that that the drive. Not everybody has it, But like I said most people do. Just. Alan: [00:39:38] Well here it is and it is… you know you make a great point because I’ll tell folks… it’s like well I didn’t get invited to the meeting. Well why do you think that would be the case? If you’re a roadblock… if you knew somebody was a roadblock would you invite them to the meeting? No. So you tell them what to do well after the fact. If you’ve got something that can provide… an opinion that’s you know an expert opinion, that’ll get you that’ll get you there. That should get you invited to the meeting. Oh sometimes you have to invite yourself. Maybe they didn’t think about it. Maybe you were an oversight or it just didn’t think– it didn’t occur to someone that it might be financial implication. And when you find out about it, invite yourself. Now where does that come from? Is that is that intrinsic drive? I think it is in part. Peter: [00:40:29] Yeah I agree. Alan: [00:40:30] I think you have to be willing to go out there, if that’s not something that comes natural to you. But it’s with that in mind… there is so much gray in this world. That’s why I could never be a good accountant. I can’t see black or white. I can’t say anything… I can say that everything’s — not numbers maybe but yeah maybe it’s you know it’s still perception and negotiable. It’s like OK you know you can’t do that with everything. But the point is there’s a lot more… I liken it to back in the day when I used to do more running. You’d be in a race road race and you know right from the get go, or from like you know a quarter or a half mile out, or longer, you start to see the crowd start to spread out and there were lots of openings and you just go for it. And it’s like well that that’s the day light that people can operate in a lot of things. It seems like things are nailed down? Nothing’s nailed down. Alan: [00:41:32] That’s not fair say but you know what I mean? Peter: [00:41:34] Yeah I know where you are going with that. Alan: [00:41:34] Because things are nailed down, but not as many as you think. Peter: [00:41:38] Don’t look at it as an obstacle, look at it as an opportunity. Alan: [00:41:42] There you go. Thank you. Peter: [00:41:43] So where can they find your book? What can my audience find your book From Technical Expert to Strategic Leadership? Alan: [00:41:50] Yeah. Yeah. They can find it. I hope they’re sitting down and have a pencil in hand – they’re gonna find it at this company. It’s called Amazon. And they’ll find it there, or they can contact me directly. I’d be happy to ship out a copy for them. Peter: [00:42:18] And how could they contact you? Alan: [00:42:21] My email address is apatterson@mentore.com. That’s mentor with an E. It’s the Italian word for mentor and I thought it sounded neat. I hope I’m somebody’s mentor before I die. Peter: [00:42:45] Well you are you are a mentor to a lot of people. Those those who attend your sessions. Those who watch your videos. Those who listen to this. One of the things I love about doing this podcast. I learn so much from all of my guests. This is going to be I think episode 73, and I’ve learned so much. I’ve learned so much today. I mean you’ve given me some additional ideas and some additional thoughts. And you’re a great mentor. Alan: [00:43:14] Well thank you Peter. Peter: [00:43:16] And I look forward in the future to having you back on the podcast. Alan: [00:43:20] You can get me any time. Alan: [00:43:25] I’m like I’m like a fast food. I’m cheap and tasty. Alan: [00:43:38] I hope I hope that makes the cut. Peter: [00:43:41] That’s going to make the cut. Haha. Alan: [00:43:41] There’s another way to describe it, but I don’t want to say it. I just don’t want to say it. Peter: [00:43:48] Oh my God. Alan: [00:43:50] To get to talk to somebody that loves what they do… How cool is that Peter? That’s that’s what you and I have in common. This is cool stuff. Alan: [00:44:03] This is fun! Peter: [00:44:04] This is this is this is passion– hahaha. I’m just going to let this. Alan: [00:44:12] Let it simmer. Peter: [00:44:14] Let it simmer for the rest of the day and I’ll just hysterically break out in laughter throughout the day. Well Alan thank you so very much once again for being a guest, and I know the audience is thoroughly going to have enjoyed our conversation. Alan: [00:44:33] I hope so. Thank you Peter.